There are good kids, there are bad kids…and then there are the Herdman kids. Between community theatre and school productions, most of us are at least passingly familiar with The Best Christmas Pageant Ever, which has long been a holiday staple for young theatre-goers and their parents. It’s a simple tale about a church Christmas pageant which finds itself with a family of uncontrollable hellions in the cast, the less-than-enthusiastic reception they get from the parish, and the travails of a young boy named Charlie Bradley, who despairs at the invasion of the “horrible Herdman” kids into the one place he has always felt safe from them. Along the way, Charlie and his family deal with all the usual Yuletide hustle and bustle, exacerbated greatly by Charlie’s mother, Grace, being roped into directing the show when the original director suffers a broken leg. (I guess she took the traditional “good luck” wish for theatre people a bit too seriously.) 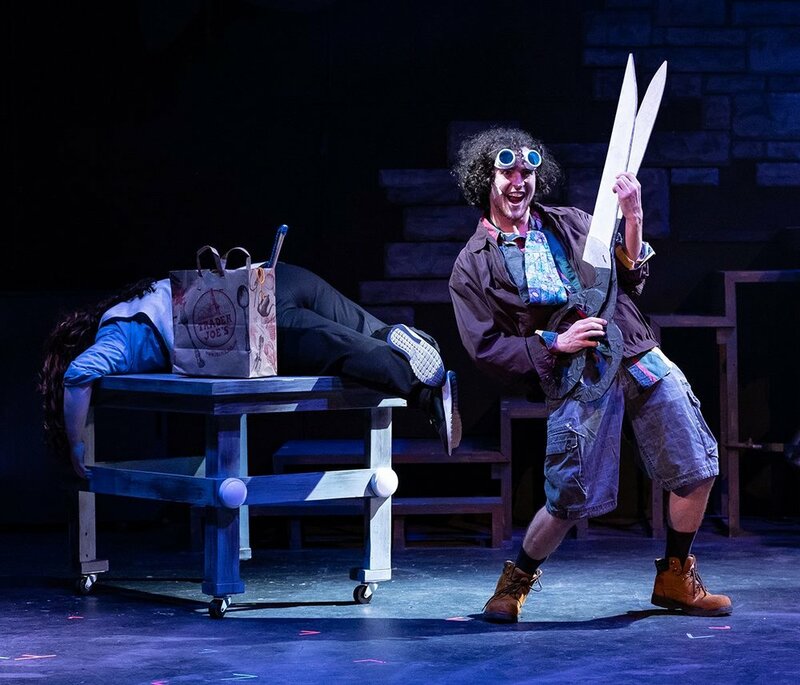 It’s a charming little play, which Columbia Children’s Theatre has taken to a new level of engagement and fun by presenting the relatively-new musical version. Director Jerry Stevenson has assembled a tight, well-rehearsed production that retains the sweet simplicity of the original, while adding a glossy layer of professionalism and energy to what could have all too easily been simply another staging of a holiday chestnut. Having directed the non-musical version myself, I can say without hesitation that the revised musical version is livelier and the characters are more developed and three-dimensional. Stevenson and Musical Director Paul Lindley II have obviously cast thoughtfully, with an eye for acting and an ear for singing, complimented by Lisa Sendler’s energetic and creative choreography. Housed in their new location, (still at Richland Mall, but in a much bigger space downstairs, next door to Barnes & Noble) CCT has more room than before to create an impressive set, complete with hinged flats and moving pieces. 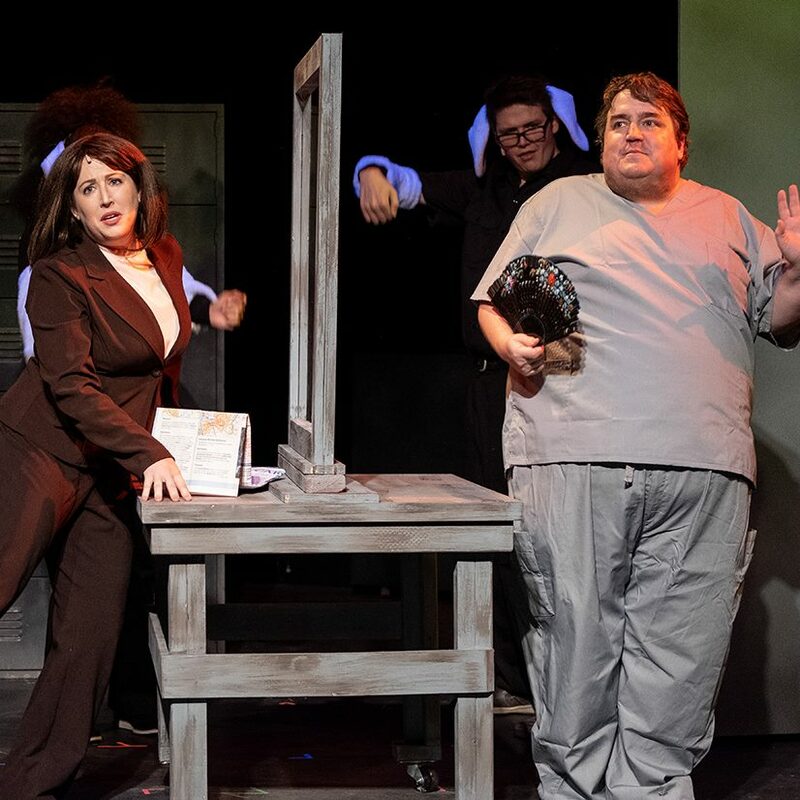 Kudos to Scenic Artists Jim Litzinger (who serves double duty as Sound Technician,) Sallie Best, Dawn Cone, Gresham Poole, and Alex Walton, whose design combines a dollhouse’s functionality with a Transformers-style “coolness” factor. The perennial CCT duo of Litzinger and Stevenson both wear multiple hats, as Stevenson, along with Donna Harvey, have assembled a delightful costume plot in which a soupcon of each character is reflected in his or her clothing. The expression “a well-oiled machine” may be cliché, but it describes this production perfectly. From the seasoned pros in the cast to the first-timers, there is never a moment of hesitation or uncertainty, yet the audience is led quite successfully to believe that the events of the show are taking place for the first time, with believable moments of surprise and legitimate responses to the events surrounding them. Much of The Best Christmas Pageant Ever’s success can likely be attributed to CCT’s education program, which is quite clearly providing quality instruction to the next generation of stage performers. To put it simply, these guys (cast and production team) know what they’re doing, and do it well. As for the Herdman kids, (Sarah Krawczyk, Julian Deleon, Annie Varner, Baker Morrison, Cort Stevenson, and Will Varner) each has a spotlight moment or two, but function mostly as a group. At first, this bunch is more of a gang of scroungy street toughs than a set of siblings, yet by the end of the show they have become part of the church family, and seem destined for at least semi-respectability. This transformation always seemed a bit deus ex machina in the non-musical, but an added scene in this version shows us the Herdman home, which is a place of hunger and squalor, with a deceased father and an oft-absent mother who works multiple jobs to (barely) keep the family afloat. When the kids sing in awe over a charity basket of simple food, the audience gets not only an insight to their unhappy lives, but also an explanation for their bad behaviour. To use one of my favourite portmanteau words, the poor urchins are “hangry” most of the time, and have little adult attention or guidance. The gift of food touches their hearts while filling their tummies, which makes the motivation for their softening more understandable. The score is eclectic and fun, and no matter what your musical tastes may be, you’ll love at least a couple of the songs, which vary in style throughout. (With numbers ranging from country to rock-n-roll to classic musical theatre, and beyond, there’s something for everyone, much in the style of Joseph And The Amazing Technicolor Dreamcoat.) I particularly enjoyed the Doo-Wop 1950s-esque “Take The Job, Grace” and “The Telephone Call,” which could have easily been composed by Lerner and Loewe. Among the handful of adults in the cast are a trio of Church Ladies, who become a quartet when Harper gets the Christmas spirit and lends her outstanding voice to those of Carol Beis, Jill Peltzman, and Kristin Young for a spirited gospel number. Their harmonies are tight, and there’s clearly not a weak singer amongst them. When COR (Columbia Opportunity Resource) came to Jasper and asked us to help with their annual Time for Art project we were excited to say yes. Time for Art is a unique project in that bidders attending the swanky gala held this year on Saturday, December 8th at the Columbia Museum of Art bid for art not with dollars and cents, but with volunteer hours. Jasper likes the idea of valuing a person in terms of the time they have to offer over the money they have to spend. But we wanted to make sure that the artists whose work is being auctioned are not only paid a fair price for their art, but that the artists themselves are honored for the important contribution they make, not only to the Time for Art event, but also to the Midlands area everyday by practicing their art. So Jasper agreed to select a panel of artists who we wanted to honor and introduce these artists to the folks at COR, who then purchased or will purchase their art to auction this weekend. In addition to choosing the artists, we also asked that COR treat the artists and their guests to free admission to the gala, that they recognize the artists at the gala and give them a round of applause, and that they allow judges for the Jasper Project to award a Jasper Project Best in Show award consisting of a feature article in the spring issue of Jasper Magazine. Keith Tolen is a retired arts educator from Kershaw County who just closed a solo show at Harbison Theatre. Lucas Sams studied art at Temple University, the University of SC, and the SC governor’s School for the Arts & Humanities, He lived for a while in Japan. From Ann Arbor, Michigan, Kathryn Van Aernum is a photographer, painter, visual arts educator, and creativity coach. 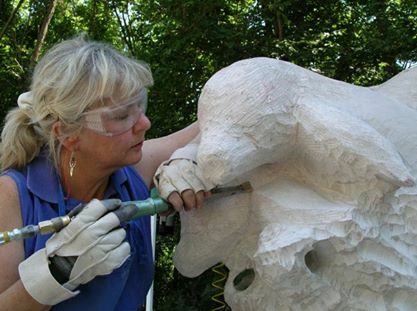 Sharon Collings Licata is a Sculptor/Photographer & Instructor, Shamanic Practitioner, Sand a member of the faculty for SC Faculty for Foundation For Shamanic Studies. 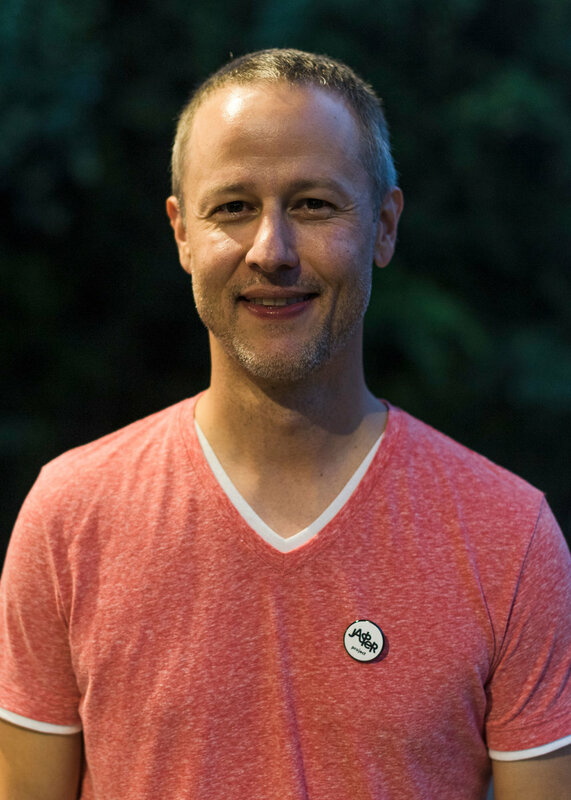 Michael Krajewski has been a part of the Columbia arts scene for almost a decade now, always advancing an avant garde aesthetic that keeps his patrons and fellow artists fascinated by his imaginative take on the world. 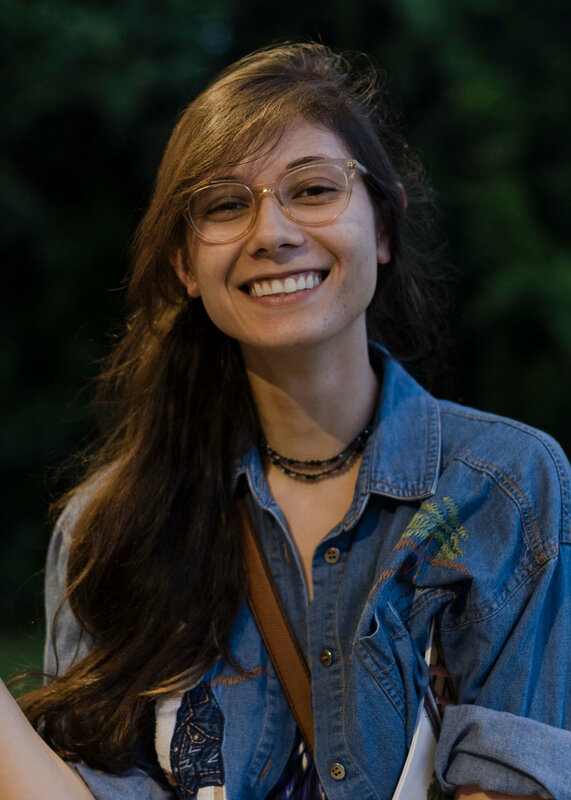 Flavia Lovatelli, originally from Northern Italy, is a sustainability artist and founder of the art Ecologie Group which brings us the annual EcoFab Trash Couture Fashion show. She is also a finalist for this year’s Jasper Artist of the Year in Visual Arts. 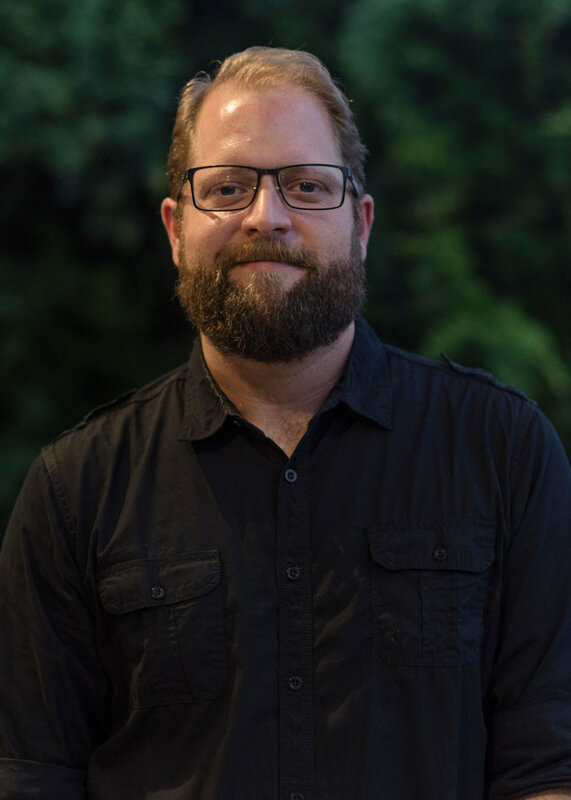 Sean is a photojournalist and art photographer who recently returned from Tijuana where he was covering the immigration clashes on the border. Sean is a former Jasper Artist of the Year in Visual Arts. 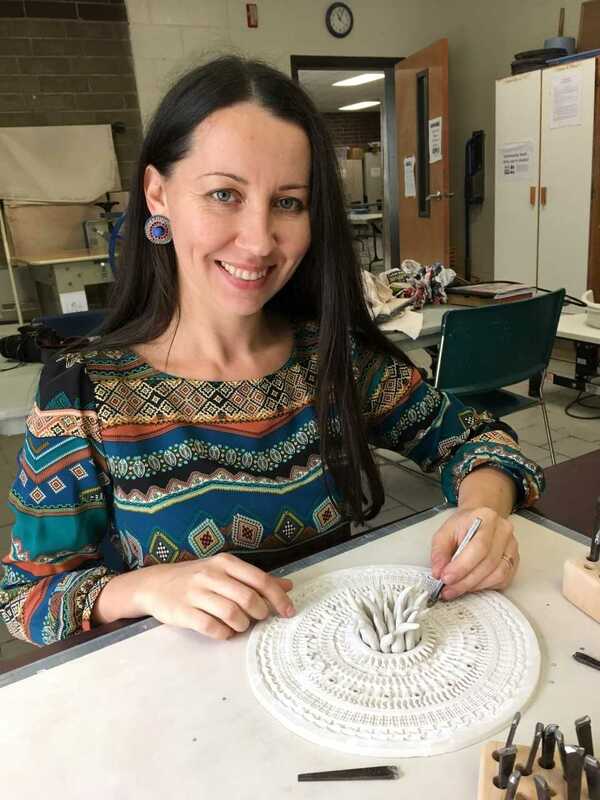 Olga Yukhno is a Russian transplant to Columbia where she practices ceramic arts. 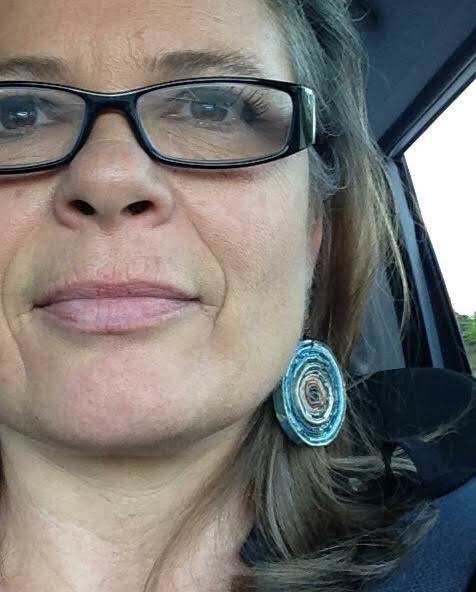 Olga is this month’s featured artist in Jasper’s Tiny Gallery Series and her work will be exhibited and for sale during First Thursday at Tapp’s Arts Center in Studio #7. She was also just named as the newest artist in residence at Tapp’s. Chapin Theatre Company Scores Yuletide Points with "A Charlie Brown Christmas"
Ah! The Christmas season! A time for frantically shopping, decorating the house, attending holiday pageants and concerts, and generally working one’s self into a frenzy over creating the “perfect” Christmas experience. In our quest to achieve these goals, we often lose sight of the joy, warmth, and simple times that can bring us the greatest satisfaction. PEANUTS creator, Charles Schulz, understood that the foibles and absurdities of human behaviour are universal, and that laughing at one’s own folly is not only good for the psyche, but also for the soul. On 9 December, 1965, television viewers were introduced to the first animated special featuring Charlie Brown and the gang. A Charlie Brown Christmas was an immediate hit, and the cartoon has become a staple of “gather-the-family” holiday viewing. Though most of us will watch the TV special at least once this year, I encourage anyone who loves it (and let’s face it, who doesn’t?) to check out Chapin Theatre Company’s live-action adaptation. The stage play is almost identical to the original, with maybe a few lines changed here and there, but very few. Purists will be pleased, and others (like yours truly) will feel the excitement of a scavenger hunt when catching the occasional rewrite or added dialogue. Directors Meesh Hayes and Beth Strickland have created a beautiful homage to Schulz’s distinctive style, yet bring a few touches of their own to keep the story fresh. Kudos also to Costume Designer Tiffany Dinsmore for her nigh-upon-identical costumes that immediately evoke the cartoon, and Scenic Designer Bill Botts, who clearly went to great lengths to honour Schulz’s signature slightly wobbly line-drawing style, on everything from Snoopy’s doghouse to the 60’s “mod” holiday trees on display. This show and its spirit clearly aim to celebrate what inspired its creation. An interesting side note: when auditions were held, all ages of children and adults were encouraged to audition, as Hayes and Strickland were open to a grown-up cast as well as a youthful one. In the end, the “teens and tweens” were chosen; a decision with which I heartily agree, having seen more than one fifty-something Linus dispensing wisdom to a Charlie Brown with slightly greying facial hair in various productions of You’re A Good Man, Charlie Brown. This is not to suggest that adults can’t present an enjoyable evening with the PEANUTS kids, but seeing actors at or relatively near the characters’ ages added a specific twinkle of holiday cheer to the show. The performances were uniformly solid, and I honestly bought into the show’s reality, essentially forgetting that these kids were born well after I graduated college. Audrey Thomas (Charlie Brown) and Michaela Grindstaff (Linus) make their trouser-role casting work beautifully, and while neither disguises the fact that they’re girls in real life, they embrace the characters with honesty and sincerity, making their actual genders immaterial. I saw Charlie Brown and Linus, period. They acted the roles as written, and succeeded. (I particularly loved the nod to the TV special, when Linus pronounces “…and they were so afraid” as “…and they were sore afraid.”) Lauren Bailey’s Lucy is just as cynical and hard-boiled as her comic strip counterpart, yet allows a touch of humanity to shine through. Juliana Mays (Sally) has only a few lines, but brings down the house when she asks Santa for money for Christmas, “preferably tens and twenties,” to be exact, and Skylar Raynor clearly has a blast in the role of Snoopy, with ever-faithful Woodstock (Ellee Burrows) in tow. The rest of the cast is talented, well-rehearsed, and maintain character(s) throughout. By now you may be wondering “why go and see it if it’s the same as the cartoon?” To this I would answer that the stage play is professionally presented by an extremely talented group of young actors who deserve to be seen; a sentiment many seem to share, as a few upcoming performances have already sold out. It’s a bit of a drive out to the Firehouse Theatre (about half an hour from downtown Columbia,) but worth the trip. On a personal note, I will add that the folks out at Chapin Community Theatre are welcoming, friendly, and proud of the work they’re doing. Before the show, I went to buy a hot chocolate, only to learn that credit/debit cards are not accepted. At the interval, a very kind lady asked if she could buy me a hot chocolate, apologizing for the lack of a credit card machine. That’s hospitality. That’s Christmas. A Charlie Brown Christmas runs through this weekend, but you’d better hurry if you want tickets, as they’re going fast. Perhaps that’s because it’s not only a good production, but one that allows adults (and even some kids) to laugh at the qualities they share with Charlie Brown and the rest of Schulz’s assemblage of mini-adults. Merry Christmas, Mr. Schulz. You got your wish. To reserve tickets, you can ring CCT on 803. 240. 8544, or email ChapinTheatre@att.net. . I saw “Cast Snoopy,” which features a few double-cast roles with “Cast Woodstock,” so if you’re going to see a specific actor, you may want to double-check the schedule. The Jasper Project’s Tiny Gallery Series returns this Thursday night —always for First Thursdays — with an installation of 3D art from Olga Yukhno, who Hallie Hayes profiled earlier this fall. Yukhno is bringing a collection of both jewelry and objet d’art purposefully selected for exhibition based on their unique and innovative designs but also on the exciting holiday presents they will make for those on the discerning givers’ lists. We caught up with Olga and asked her a few questions about this upcoming show. Jasper: From an earlier conversation with you we know that you are from Russia and have been in the states about 10 years. Can you specifically reflect on your time in Columbia and tell us how you've grown as an artist and who has influenced you the most in terms of your growth? Olga: My time in Columbia has been challenging at times- it’s very hard to change countries, cultures and even art media. However, I’m tremendously grateful that I faced and was able to overcome such challenges as this process made me a better artist and, I hope, a better human being. In the 10 years since I moved to Columbia, it has changed a lot. I feel that the last few years especially have been particularly good for the local art scene. I’m excited to not only witness this change but be an active part of it developing my work, helping other artists, connecting people and creating new opportunities! I’ve been lucky to have quite a few people in my life who have influenced and supported me. Until this year I did all my work in community studios. Over the years I received so much encouragement from fellow artists who were working next to me! It has been a very humbling experience and I’m very grateful for all the friendships I made along the way. Sheri Hood, the former owner of Our Hands Together Studio, has been one of the biggest supporters I’ve ever had and a wonderful friend through many trying and happy moments in my life. Her incredible kindness and wisdom have changed my life in many ways and served as a personal example for me. My first Solo Exhibition and consequent gallery representation also happened in Columbia. Donna Green of Southern Pottery believed in me and gave me this opportunity that served as a powerful push in the development of my work. Since then I have been working with many other galleries throughout the Southeast but the first person who took a chance with my work will always have a special place in my heart. I’ve been working at USC as the Gallery Director of McMaster Gallery since this summer and it has been an absolutely amazing experience of professional and personal growth. It’s been such a joy working alongside so many talented and dedicated people and being able to bring incredible art to Columbia. And, of course, probably the most wonderful thing that I owe Columbia for is meeting my wonderful husband who is my biggest fan and supporter. Jasper: What have you been up to since we last spoke earlier this year? Olga: Life is getting more exciting every day! As I mentioned above, I’ve been enjoying curating exhibitions at McMaster Gallery. But I also work with other groups in Columbia to bring more opportunities to our city. I have been working with Flavia Lovatelli to organize a series of EcoFab art exhibitions and fashion shows in Columbia and other parts of South Carolina. Just last week we celebrated the closing of EcoFab 2.0 at Anderson Arts Center and now we are getting ready for our biggest event yet - Charleston Fashion Week. I also serve as a Gallery Coordinator for the Crooked Creek Art League and a Workshop Coordinator for Midlands Clay Arts Society. I’m a big believer in promoting and connecting people and creating new opportunities for artists. So I try to find ways to express this passion! My dream is for a bigger, more vibrant art community working together to help all the local talent really flourish! Olga: First of all, I would like to thank the Jasper Project for this opportunity! I’m honored to have been selected and I know I’m in great company. I will be showing some of my pieces from the Meditations Series. They are ceramic and mixed media Mandalas that symbolize peace, happiness and balance. They have brought a lot of joy and mindfulness in my life and I think these are the things we can all benefit from in the Holiday Season and the New Year. I will also have some jewelry. Personally, I love all jewelry related things- wearing, making, collecting- and I’m excited to share some of my favorite designs with the Jasper patrons! Jasper: How does the Tiny Gallery Series work for you as an artist -- is it beneficial to you at all, and how so? Olga: The Tiny Gallery Series is a wonderful idea! I love the opportunity to have a mini Solo Show as a part of a larger event. What I’m mostly excited about is meeting new people who have never seen my work. I think Jasper is a perfect “cultural bridge” to connect supporters of visual art, literary work and a richer cultural life in Columbia. I’m very glad this project has been started and look forward to many more successful events! 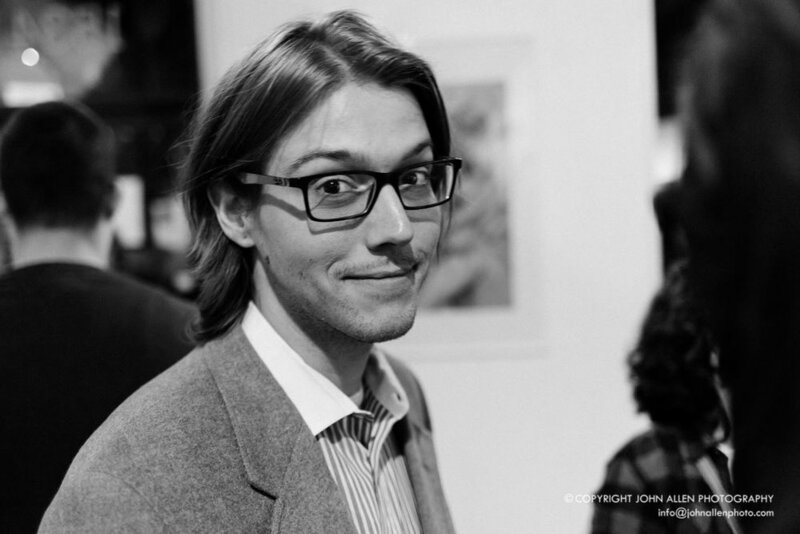 Jasper: After the Tiny Gallery Series, what's next for you and your art? Olga: My 2019 is shaping up to be very exciting! 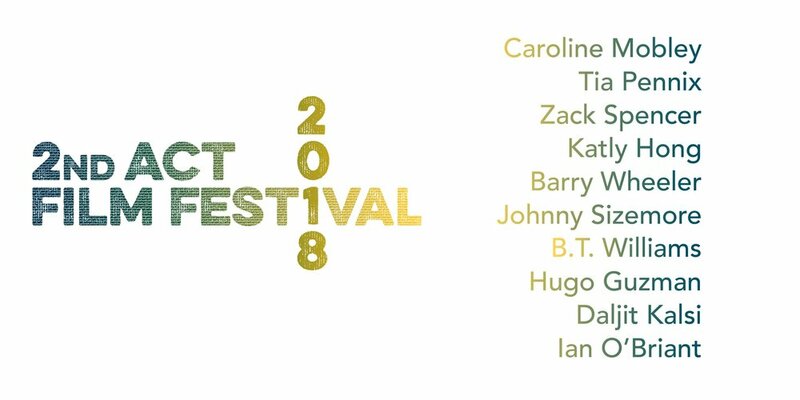 The Tiny Gallery Series is a perfect introduction for me into the TAPP’S community as I will be a Resident Artist there for 5 months with a Solo Show in May. I’m also working on a collaborative project with the amazing Columbia based artists Susan Lenz and Flavia Lovatelli to create a joint exhibition in conjunction with the Deckle Edge Literary Festival. Our show Alternative Storytellers will focus on literary stories with unexpected, thought-provoking new endings. I’m very honored to have been selected as a featured artist for the Southern Exposure Series in March. This will be a very unique experience for me of creating a body of work based on the music performed at the closing concert of the Series. In addition to Columbia based events, I will have a Solo Show Beneath the Surface at the Francis Marion Gallery in Florence, SC from February 18 till March 18. This Sunday, the Columbia Museum of Art will be putting on the second installment of its new Write Around Series, featuring poets Joy Priest and Tim Conroy in conjunction with the opening of the CMA’s newly designed collection galleries. This time around, local poets Joy Priest and Tim Conroy are sharing their work. “Joy and Tim are amazing. I’ve been a fan of their work for years, so perhaps for personal reasons, I reached out to them,” McManus continued, “But I also wanted the two of them together because the range of their voices together will make for one hell of a reading. Both are powerful poets on the page, but they also have a commanding presence on the stage." Hailing from Louisville, Kentucky, Priest is currently an MFA candidate in poetry at the University of South Carolina. 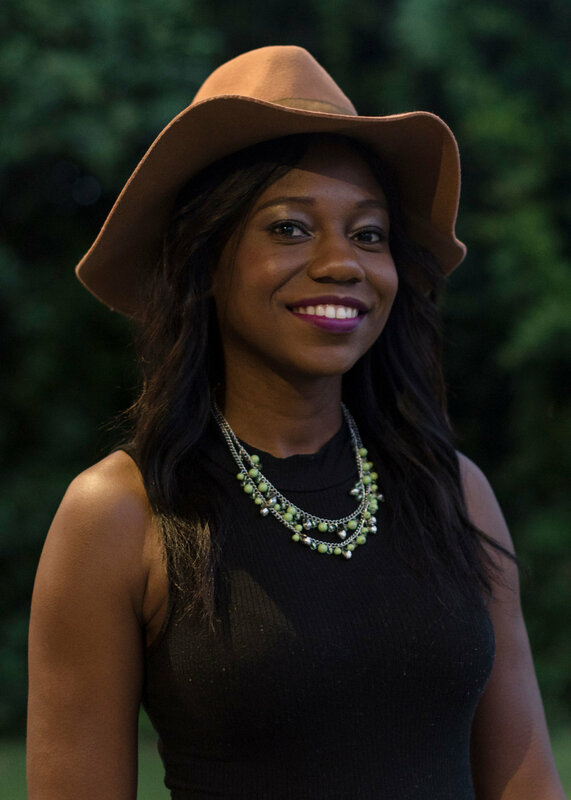 She is the recipient of the 2018 Gregory Pardlo Fellowship at The Frost Place and has received support from the Hurston/Wright Foundation, the Bread Loaf Writers' Conference, and the Fine Arts Work Center at Provincetown, among others. She is formerly an associate poetry editor for Narrative Magazine and senior editor emerita at Yemassee Journal. Her poems have appeared or are upcoming in Blackbird, Callaloo, Four Way Review, The Rumpus, Best New Poets 2014, Best New Poets 2016, and The Breakbeat Poets. Conroy is a former special education teacher, school administrator, and vice president of the South Carolina Autism Society. His work has been published in journals, magazines, and compilations including Fall Lines, Jasper, and Marked by Water. In 2017, Muddy Ford Press published his first book of poetry, Theologies of Terrain, edited by Ed Madden, poet laureate of the City of Columbia. A founding board member of the Pat Conroy Literary Center in Columbia. Conroy was influenced to start writing from a young age by his older brother and sister, but he didn’t pursue writing until later in life. Three years ago, he was influenced by a presentation from Kathleen Robbins on her book of photographs of the Mississippi Delta, Into the Flatland. “I take this book home, and I’m inspired to write poems from the book,” Conroy said. When asked to describe puppet act, “Milo the Magnificent,” along with the duo behind the magic, Alex & Olmsted (Alex Vernon and Sarah Olmsted Thomas), artist director for the Columbia Marionette Theater, Lyon Hill, captures the moment with three enchanting words: Charming, uplifting and playful. That’s right! This one-of-a-kind production, “Milo the Magnificent,” will be featured in Columbia at CMT, one of only two guest artist brought to CMT per year. As a show for all ages, this is one to bring amusement, entertainment and excitement to all. The production will run on Friday, November 16th at 7 p.m. and Saturday, November 17th at 11 a.m. and 3 p.m. Ticket cost is $5 per guest, ages 2 and up. The Friday evening performance is a unique one, as CMT typically does not put on evening productions; however, Milo the Magnificent will run one time on Friday evening, giving guest the opportunity to experience the show in all its glory. A true, magical experience. 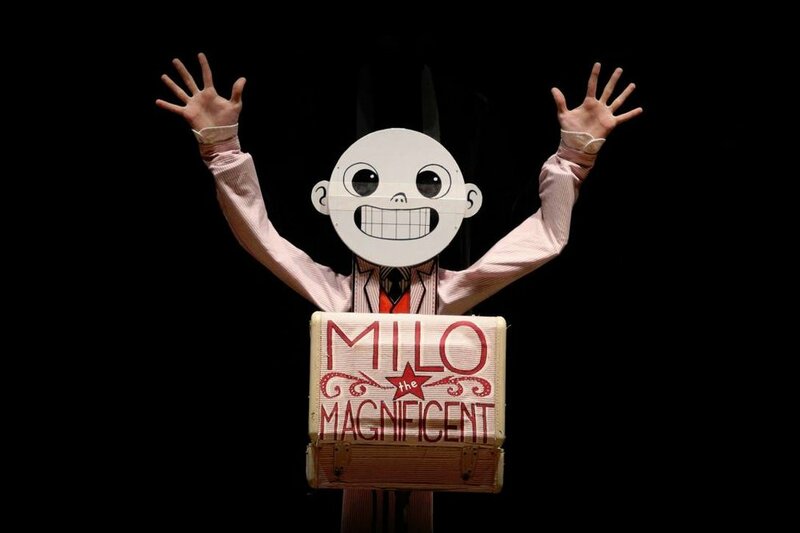 To experience Milo and his magic, grab those close to you and come out to Columbia Marionette Theater this weekend to get a taste of Alex & Olmsted’s, “Milo the Magnificent,” and all of the unique and fun entertainment that this production has to offer! Last month, The Jasper Project presented the first installment of its new Tiny Gallery series. With the help of the Columbia community, the inaugural event was a success. 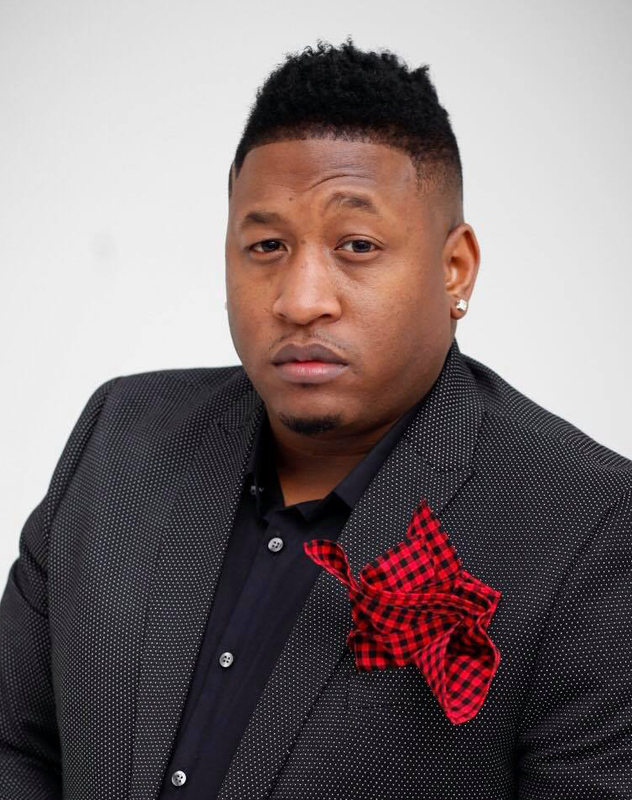 Continuing on this series will be local artist, writer, and creator, Thomas the Younger, aka Thomas Washington. I was fortunate enough to meet with Washington this past Tuesday and experience his person as he shared with me details about his art and life and all the ways those two overlap. Washington shared with me how after four he started consuming all the art and literature he could find, whether it was the Bible, stories, or the dictionary. As for how he started his art, specifically, he began by copying his father. So, as for what to expect, really, it’s anything. It’s a convergence of the above, a reflection of the self, a reflection of the world. It is none of this, yet it is also all. Confused? Good. That means you’re thinking. It means you’re curious. To find some answers or better yet, more questions, come see Washington’s exhibit this Thursday at 6:00 p.m. at Tapp’s Art Center, Studio 7. Received this message this morning from a dear friend and member of our arts community, Cassie Premo Steele, and wanted to share it with all of you. I woke this morning with my heart heavy about yesterday’s events at the synagogue in Pittsburgh. I know you’re feeling it, too. So I did what I always do when my heart is yearning for healing and change. I made something. -Art by Amy Alley that depicts the Cherokee word for “fight,” which is not the kind of fighting we do now in our society. -Dialogue between Hadassah, a theology professor, and Sanna, who knows that she is echoing the phrase by Rabbi Heschel, who marched with Martin Luther King, Jr., at Selma. I hope this little gift ripples out with waves of peace and understanding today. 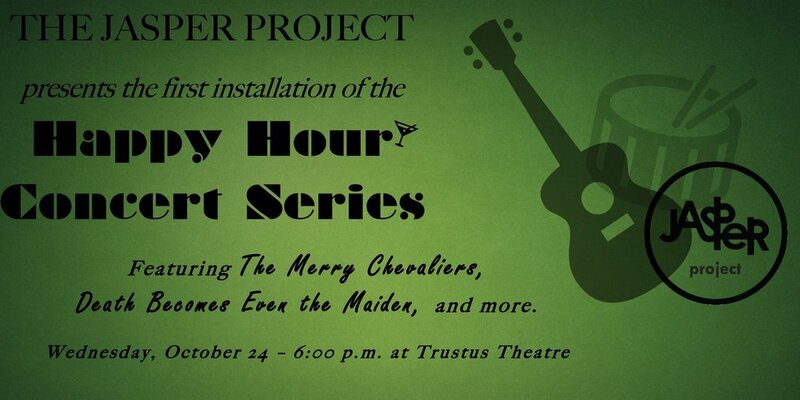 The Jasper Project is kicking off a new series of early evening fun on Wednesday with our first ever Happy Hour Concert featuring Les Merry Chevaliers and Death Becomes Even the Maiden. The purpose of this series is to provide a mid-week time to listen to original local music, have a drink with friends, and still get home in time to put your kids to bed and not wreck your sleep schedule for the rest of the week. This is also an important fundraiser for Jasper Magazine. Come on out to Trustus on Wednesday night. Doors open at 6 for a cash bar, happy hour snacks, with music starting about 7. Tickets are $10 at the door – or, join the Jasper Guild at any level and get in for free AND become eligible for the drawing of a pair of tickets to this year’s 2nd Act Film Festival coming up on November 7th. Jasper: First of all, who are the Merry Chevaliers, what instruments do the band members play, and what are the members’ unique missions in the band? Pierre Balz – rhythm guitar, glockenspiel, digeridoo – unique mission is to be fifth most handsome band member. Guillaume Guillotine – lead guitar -- unique mission is to be fourth most handsome band member. 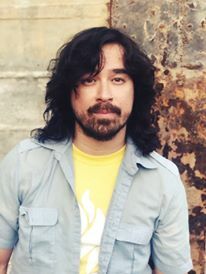 Garique Le Freaque – drums -- unique mission is to be third most handsome band member. Count De Monet – vocals -- unique mission is to be second most handsome band member. Menage O’Shea – Bass -- unique mission is to be most handsome band member. Jasper: Where did the concept of the Merry Chevaliers come from and how did you guys go about actualizing the idea into a musical group? LMC: After a long night of drinking sweet claret and reading Rimbaud, the idea of dressing in French frippery and playing the dulcet tones of punk rock sprang fully formed from Pierre’s head like fair Athena in her gossamer robes. While it is likely a violation of several sumptuary laws, the powdered wig hides Pierre’s bald spot. The band formed when Pierre wrote some songs and asked his friends to sing along. When they wouldn’t, he asked these guys. Jasper: How long have you been together? LMC: We’ve been together for a year and a half, and have played shows in Columbia, Charlotte, Charleston, and Greenville. We’ve also been featured on WUSC’s Columbia Beet, WXRY’s Unsigned, and Sirius XM’s Goldie’s Underground Garage. Jasper: What kind of music do you play and why? LMC: We play power pop punk – because we like it and think it’s fun for audiences to sing along and jump around to. Jasper: What are your musical backgrounds and what do you guys do for day jobs? LMC: Mssrs. La Freaque and O’shea have played in many other area bands. The other three are rank amateurs. For day jobs, we are all men of leisure. Jasper: What do you want people to experience from your concerts? LMC: Life can feel pretty dark sometimes – we’d just like people to have a little break to have some fun, dance, and laugh. Jasper: What’s next for the Merry Chevaliers after the Jasper Happy Hour concert? Jasper: What did we not ask that you’d like our readers to know? If you or your band would like to participate in Jasper’s Happy Hour Concert Series - a fundraiser for Jasper Magazine - hit up Cindi Boiter or Kyle Petersen. “I am very sorry, sir,” said Bob. I am behind my time. Based upon the Tom Stoppard film of the same title, Lee Hall’s Shakespeare In Love retains “about 90%” of Stoppard’s film dialogue, according to Kevin Bush, Marketing Director for USC’s Department of Theatre and Dance. The old adage of “if it ain’t broke, don’t fix it” is wisely heeded by Hall, who still manages to bring a freshness and slight opening-up of the film to his stage adaptation. Also impressive is the Elizabethan-meets-Techno music by composer Paddy Cunneen, which underscores (pun intended) the timelessness of not only Shakespeare’s works, but also the message that tumultuous love affairs existed well before gossip tabloids and tell-all books. 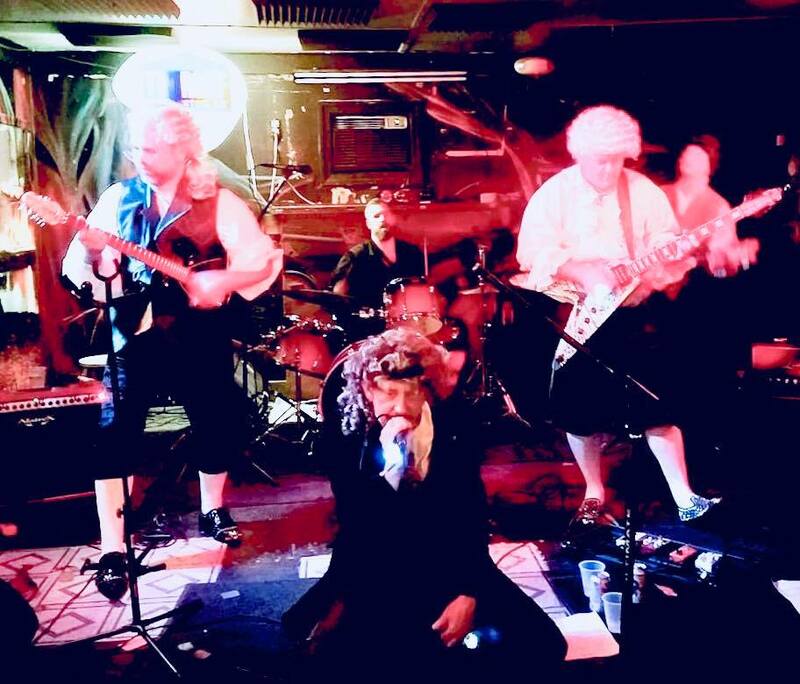 Having live musicians onstage, augmenting the recorded bits was an excellent choice, and the overall aesthetic was that of an Elizabethan love story that could just as easily happen today. Staying faithful to the movie’s plot, the play, a young William Shakespeare is having difficulty finishing his “comedy” of Romeo and Juliet. With opening night creeping ever closer, Shakespeare’s anxiety and frustration put production of the show into increasing unlikeliness, until he finds his muse in Viola, a young woman of the upper classes who disguises herself as “Thomas Kent,” and manages to land the role of Romeo (ironically, opposite a boy in female dress as Juliet, given the era’s ban on women performing onstage.) A romance quickly blossoms, despite Viola’s engagement to a nobleman whom she neither loves nor understands, and who seeks her dowry to prop up his estate in the Colonies. As in the film, mistaken identities, double-and-triple layers of deception, and Shakespeare’s Cyrano-esque courtship of Viola (with his friend, Kit Marlowe, supplying romantic dialogue from a nearby hiding place,) propel the plot. As one might presume, chaos obviously ensues, but to paraphrase the title of another of The Bard’s works, all’s well that (almost) ends well, and though Viola does, indeed, depart for The New World, the ensuing heartbreak prompts Shakespeare to reconceptualize Romeo and Juliet as a tragedy, overcoming his writer’s block, and finishing what eventually becomes one of his most celebrated and oft-performed plays. As Shakespeare, John Romanski is less the dashing Bard of legend, and much more an ordinary young artist, struggling to find fame and love. Bravo to Romanski for taking a role that could have been played as a whinier version of Charlie Brown mooning over The Little Red-Haired Girl, and embracing the joy and enthusiasm he has for his writing and performing troupe. Though not a doppelganger, Romanski’s look definitely offers a reasonable approximation of what Shakespeare may have looked like as a young man. I particularly enjoyed Romanski’s layering of emotions and reactions to the series of successes and failures his character faces. To say that his fortunes swing like a pendulum is an understatement, yet Romanski never makes his transitions from happiness to despair to fear to ecstasy jarring or overly sudden. He plays the subtlety of Shakespeare as expertly as the bombast, and never allows himself to veer into a parody or exaggerated comic version of the role. Olivia Hensley’s Viola is another “perfect fit” for her role, with her pluck and determination paired with softness and genuine care for the playwright with whom she finds herself falling in love. Hensley’s look is gently beautiful, with the flowing hair and stylish dresses of an Elizabethan lady of means and stature, which makes her successful disguise as a boy even more impressive. As with Romanski, she never falls victim to caricature, but does change her voice and bodily movement to create both an elegant ingénue and a male commoner who is honestly believable. Her final letter to Shakespeare is a mini tour-de-force, and Hensley is spot-on with her delivery, mixing resignation, sadness, and “smiling against tears” into a brio of emotions that provide one of the show’s most touching moments. The rest of the cast is uniformly solid, which speaks volumes of Director Andrew Schwartz’s skills at casting and direction, as well as the quality of education USC Theatre students are receiving. This was a good play, period; not just a “good college show.” I would personally place it in competition with most professional shows I have seen. The cast was well-rehearsed, the timing and delivery were impeccable across the board, and was over long before I wanted it to end. 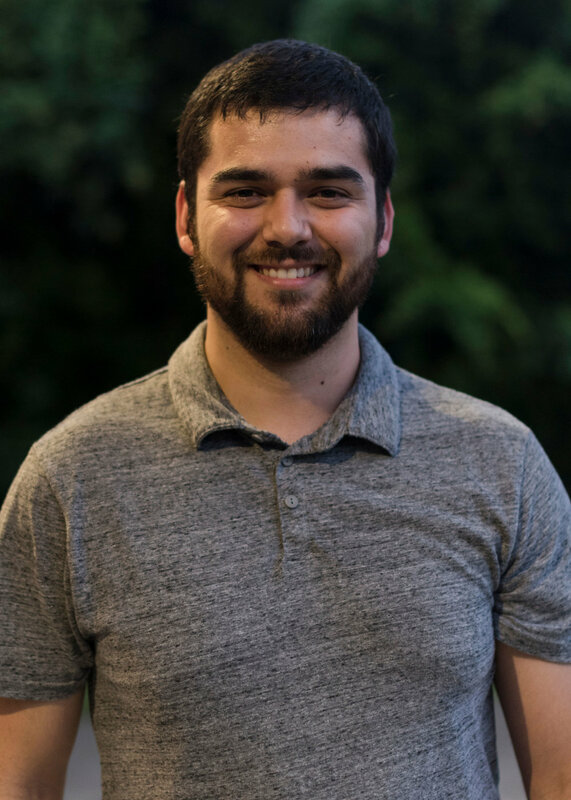 Scenic Designer Nate Terracio’s set is semi-minimalist, with a few flourishes of grandeur, which perfectly reflects the events and encounters Shakespeare experiences throughout. I’m not sure whether or not that was the motivating force behind his design concept, but it was most effective in tying together the physical locations and the mindset of the protagonist. Again, I offer my mea maxima culpa for my tardiness to all involved with this most enjoyable production. Yours faithfully promises to be Johnny-on-the-Spot with getting his job done next time. Bravi, Shakespeare In Love company! You truly created a work of which you can be quite proud. When one thinks of The Silence Of The Lambs, words like “hilarious” and “side-splittingly funny” don’t generally come to mind. The classic film, starring Jodie Foster and Sir Anthony Hopkins, sent chills up the spines of movie-goers worldwide, but other than one or two cheeky asides from Hopkins, the movie was a straight-up crime drama/thriller without much comic relief. Such is definitely NOT the case with Trustus Theatre’s season-opener, Silence! The Musical, which serves up an affectionate but irreverent parody of the original. As Dr. Hannibal Lecter, Hunter Boyle is at the peak of his game. 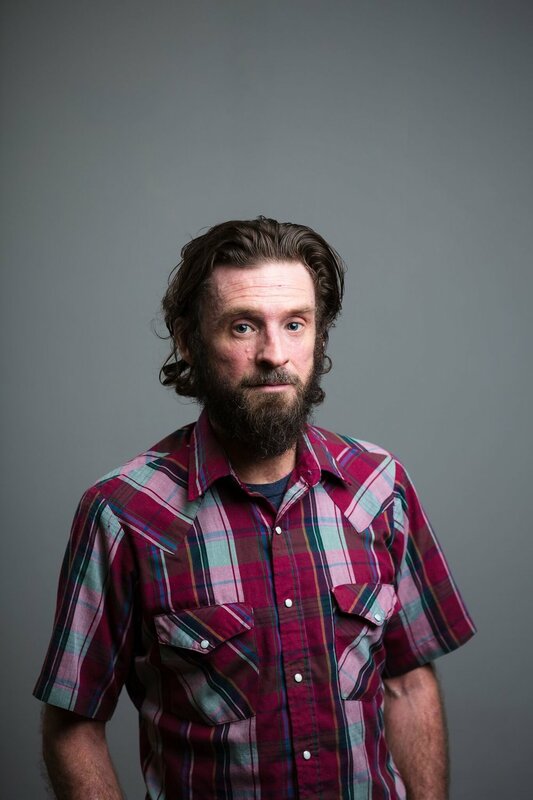 I attended the show with my friend, local actor Bill Arvay, who declared Boyle’s performance “the best thing I’ve ever seen him do.” While this may have been a bit hyperbolic, given Boyle’s rich resume of memorable characters, I understood the sentiment. Boyle’s Lecter isn’t quite as menacing as Hopkins’, which illustrates the understanding Boyle and Monk had of the character as he fits into this somewhat Bizzaro-World spoof. Boyle is less genius cannibal, and more smartass intellectual, and it works. One of the many tips of the hat to other theatrical works is his prison suit number, 24601. (Les Mis fans, admit it, you were mentally singing it once you noticed the number.) Boyle is still the “Hannibal The Cannibal” from the movie, but he deftly takes the lighter script to heart. Straight lines are played for laughs, and Boyle had to hold for laughter for at least thirty seconds when Lecter corrected S(h)tarling on the famous “Fava beans and a nice Chianti” line. Patrick Dodds, whose considerable talent seems to grow and develop with each role he undertakes, manages to create a frightening Buffalo Bill who still fits in with the MAD Magazine atmosphere of zaniness. While making the part his own, Dodds winks at the character with a few straight-from-the-film bits. Fans of the movie will remember the odd tic of a laugh Buffalo Bill tries to suppress when asking Starling about a missing woman she is seeking. “Was she like, a big, fat, person?” isn’t a funny line per se, but when Dodds adds the brief snicker to his query, the result is a cascade of knowing laughter from the audience. While Dodds is younger and a bit more manic than his screen counterpart, he is a perfect fit (see what I did there?) for the demented lunatic of the stage adaptation. Dressed in all black, with white floppy ears, the other five actors play “everyone else,” including a flock of lambs, establishing individual characters by adding a jacket, hat, or comparably simple garment. Costume Designer Amy Brower Lown succeeds in maintaining a specific, cohesive, style without ever compromising the ersatz reality of the script. Lown’s concept is brilliantly supported by LaTrell Brennan, Robin Gottlieb, Abigail McNeely, Samuel McWhite, and Mike Morales, who transition seamlessly from character to character. 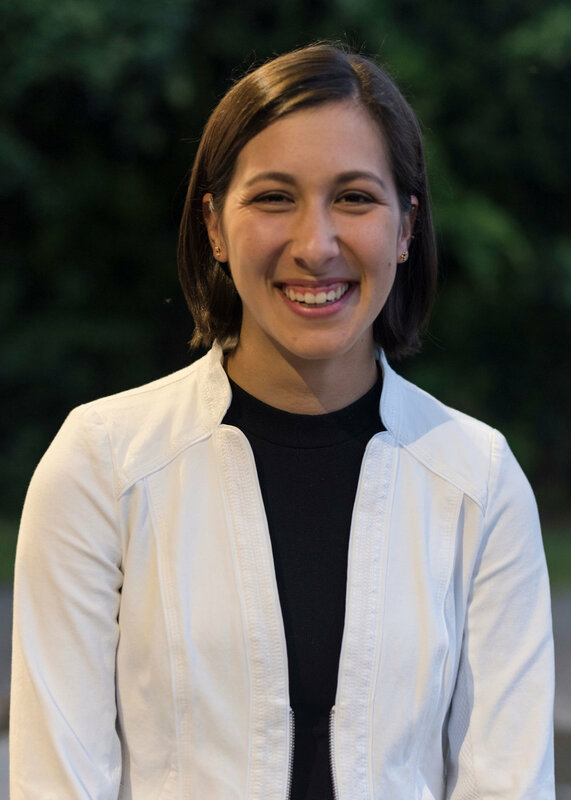 As Ardelia, Starling’s roommate and is-she-or-isn’t-she girlfriend, Brennan not only develops a three-dimensional character, but also displays great facility at delivering a punchline, often remaining perfectly serious during her funniest moments. Gottlieb brings her customary stage presence and overall panache to playing a series of all-male characters. (Another inside joke is set up when Gottlieb appears as Starling’s deceased father, prompting Starling to plead “Papa, can you hear me?” with Yentyl–like wistfulness.) In an uncredited cameo as mental patient Miggs, Gottlieb hilariously re-creates the (in)famous moment when Miggs masturbates and flings the resulting *ahem* substance at Starling, substituting a can of Silly String at a decidedly seminal moment in the show. Working double duty as Buffalo Bill’s victim, Catherine, and her US Senator mother, McNeely demonstrates an almost chameleon-like ability to morph into completely different appearances. I honestly didn’t realize the roles were done by the same person until well over halfway through. McWhite’s primary alter-ego of Lecter’s keeper, Dr. Chilton, is less pathetic than the film Chilton, interpreted more as a fast-talking pickup artist than a socially awkward nerd. While we can easily imagine the movie incarnation moping in depression after failing to seduce Starling, McWhite’s Chilton has probably had more successes than failures with women, and displays a delightful “your loss, baby” attitude, likely moving on to his next potential lover. Morales was the most difficult actor to track, as he, like McNeely, apparently has the ability to shape-shift. I suspect it was he who played the geeky entomologist who also fails to woo Starling with his offer of “cheeseburgers and the amusing house wine.” ( This line is pretty much a throwaway in the movie, but takes on great hilarity when placed in the world of Silence!) Morales also has a most amusing death scene as the ill-fated Officer Pembry. As with the rest of the show, what was frightening and/or grotesque on the silver screen becomes fodder for hilarity onstage. Sam Hetler’s scenic design is both functional and visually intriguing, creating a unit set that serves as over a dozen locations. Hetler’s work is showing up with growing frequency on Columbia stages, and he never fails to deliver a professional-quality set with a few unexpected flairs. Marc Hurst’s lighting design reinforces Hetler’s fun-house set with dramatic changes in intensity and color, never letting the audience forget that this is a bizarre alternate reality. Particularly impressive were his use of lighting Buffalo Bill’s lair from beneath the playing surface (blending perfectly with Hetler’s dungeon-wall motif,) and a sudden full-stage switch to fuzzy black-and-green to simulate the view from a pair of night-vision goggles. Hurst also helps create locales with projected establishing texts such as “Baltimore Nuthouse” and “Mr. Belvedere, Ohio,” among others. Musical Director Randy Moore lives up to his customary professionalism, making piano, keyboard, and drums sound like a full orchestra. Bravo to Trustus and Moore for utilizing live musicians in a time when far too many theatres are opting for “canned” pre-recorded orchestration. 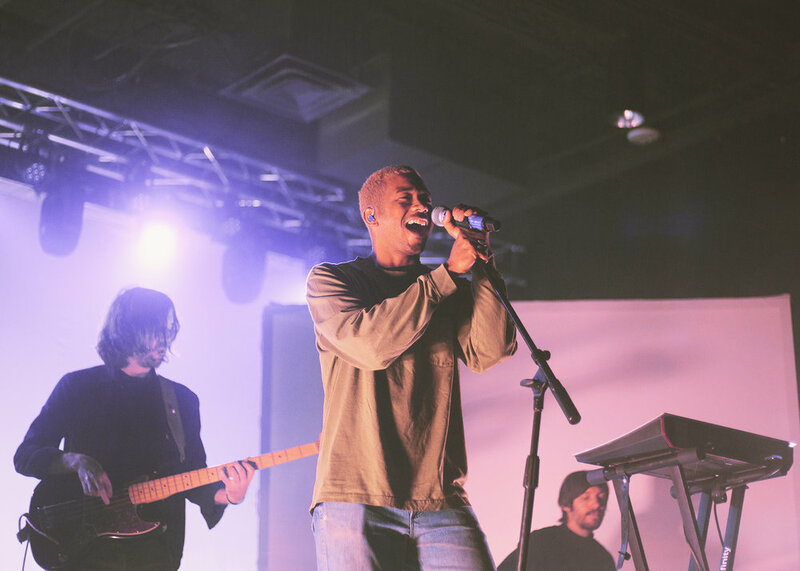 The freshness and obvious communication among the four instrumentalists added another layer of connection to the show, as well as the audience. Silence! runs through 3 November, and tickets can be purchased online at Trustus.org, or by ringing the box office on (803) 254.9732. Word is spreading, and tickets are likely to be going fast, so reserve your seats soon for this delightfully macabre, oft-profane, “egregiously misrespectful” piece of theatre that maintains Trustus’ commitment to professional and well-produced art. Local artist, Karl L. Larsen, dives into his inner being and views the world through a fresh perspective in his upcoming show, Untethered, opening October 5th at Frame of Mind, with a reception from 6:00 p.m. to 9:00 p.m. With topics that are meant to be mind-boggling and controversial, this show will offer not only originality, but opportunity for discussion on topics that deserving of discourse. The 33-year-old Columbia native will be showcasing art that posits a question that is faced in everyday society but is often avoided: Why do we believe what do believe? A question that revolves around this broad idea of thinking for oneself. Larsen shows his art through new eyes, by creating in a manner that involves him “taking off the lenses,” and showcasing pieces that dwell in his own thoughts, leaving breadcrumbs behind for the viewer to pick up, and make what they will from; hopefully exploring their own views. 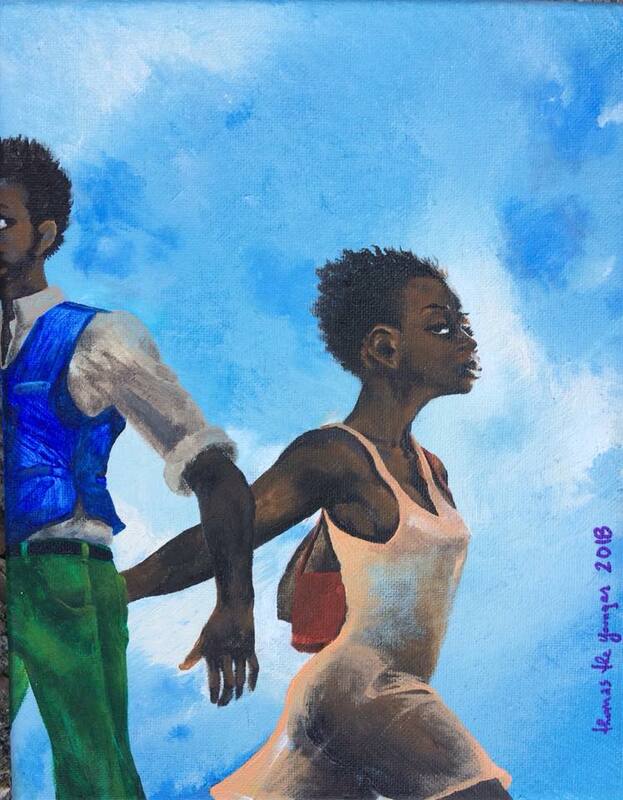 With art that explores a multitude of different media and style, the artist hopes that his work will create dialog through the vision that he has created from his own ideas; a vision that isn’t corrupted by the media. With only two pieces that come from a personal side of Larsen’s life, each opposing piece contains different content that is embodied with a rabbit hole of possibilities for each individual to explore, asking questions such as, why do you look at the world the way that you do? Larsen has been creating art for 5 years now, however, his show Untethered isn’t about creating beauty from his external view - it is about creating work from an internal perspective. The artist debates the idea that society is consumed with what we are getting from the media and believing everything we are told without taking in our own perspectives, which is what one needs: to be challenged and to have their mind stimulated. Through this collection, Larsen is not only providing a new perspective on the strange things in the world around us, but he is opening opportunities to learn more about the things that are really processing in the viewer’s own mind. “So, the fun thing about it is that, not only can you gain a new perspective on things, you learn more about yourself,” Larsen explains. Along with this thought driven collection, Larsen will also display fashion that he designed via individuals at the event and his popular painted couch, which has circulated Columbia, at opening night. One should come into this show with an open-mind, expecting the unexpected and be willing to dive into their own ideology through the ideas of another. Larsen has no intention of this show portraying what his previous show offered, but instead is providing a whole new chapter of work. Untethered will be displayed for two months, closing on November 30th. 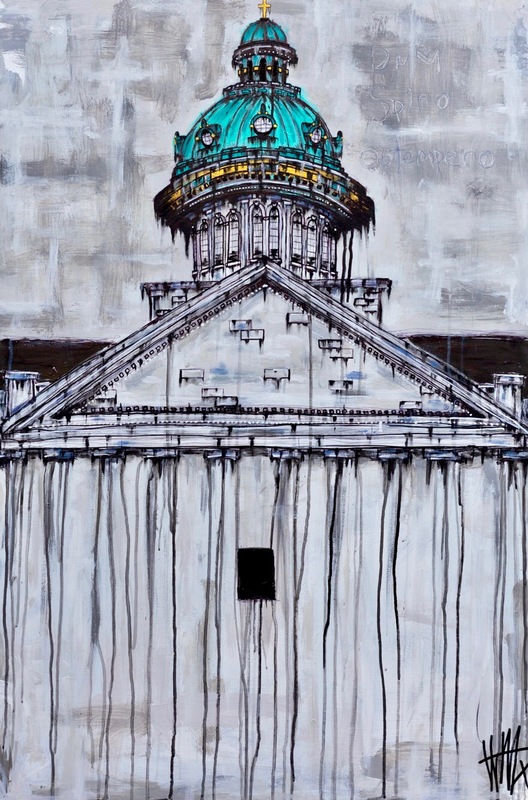 To view more of Larsen’s work, you can purchase tickets to an event that he will be featured at, Collectively Supported Art, on November 9th (tickets available at the opening reception of Untethered) or find him painting at the West Columbia Fall Back Fest on November 2nd. Columbia is lucky to have an artist who breaks boundaries and challenges not only himself, but his audience; one who explores controversies through a new, clear perspective. The Jasper Project Depends Primarily on Guild Membership to Do What we Do — Make Magazines & Literary Journals, Put on Concerts & Film Fests, Host Artists Displaying their Work, Blog, and More. We couldn’t do what we do without YOU — and when YOU join the Jasper Guild You become US — it’s an amazing transformation of energy. Please consider joining or renewing your membership in the Jasper Guild today by clicking on SUPPORT on our home page. WE want YOU to be one of US. Tracy sends a cheerful "Good Morning, Baltimore!" to her hometown. Okay, I will freely admit that the first couple of times I attended a show at OnStage Productions, my eyes concealed a perfect gem, literally at my feet. When one arrives at The Old Mill in Lexington, it looks like someone converted a couple of ancient warehouses into an upscale brewpub, added a small shop or two, then called it a day. While these establishments do exist, there’s also something quite special just a few feet underground. Housed in a renovated downstairs area, OnStage has created the look, feel, and atmosphere of a cozy, hip, Off-Broadway house. The space is a bit cramped, and has a slightly “rough at the edges” feel, as I firmly believe all good playhouses should. Be prepared to sit close to your seatmates, but that’s all part of the aura and style OnStage has created in building what could easily be a 100-seat, upstairs, Greenwich Village theatre. Just set your personal space requirements to “NYC mode,” and you’ll have a blast. Speaking of blasts, Director Robert Harrelson truly blew us away with Saturday night’s performance of Hairspray, The Musical, which continues its run this Thursday-Sunday. With a cast full of talent, and some most innovative staging, Harrelson makes the show work like a well-oiled machine. The set, though simple in design, effectively creates the show’s various locales through a quartet of four-sided columns, outstanding use of lighting to suggest a specific space, and a never-ending flow of kinetic energy from the cast, who all move things around just in time to be perfectly in place for the next scene. The action of the play never wanes, nor does the seemingly boundless energy of the cast. One of the highest compliments I can give a musical is that it “never stops moving,” which perfectly describes this version of Hairspray. And of the performance, itself? Well, it had me singing along with half the score, and laughing uproariously, often at the most inappropriate jokes and one-liners. Again, I must sing Harrelson’s praises for DOING THE SHOW AS WRITTEN. Hairspray, the John Waters film which gave rise to the musical, was subversive as hell, made fun of cultural stereotypes, and embraced the taboo with mischievous glee. The musical has toned down a bit of Waters’ signature vulgarity, but keeps its norm-shattering and cheeky storyline intact. Harrelson has not altered the script in any way, nor has he “bleeped out” a single potentially-controversial line. 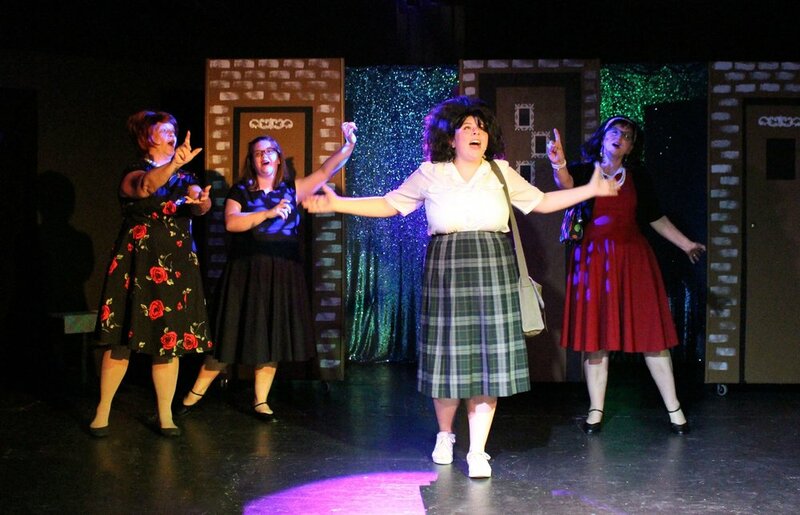 This is Hairspray as it was written to be played, not a sanitized-for-grandma production. (Incidentally, I saw several grandma-types laughing and enjoying the show right along with me.) Bravo for Harrelson for his faithfulness to the work, and the ensuing quality that comes with that integrity. 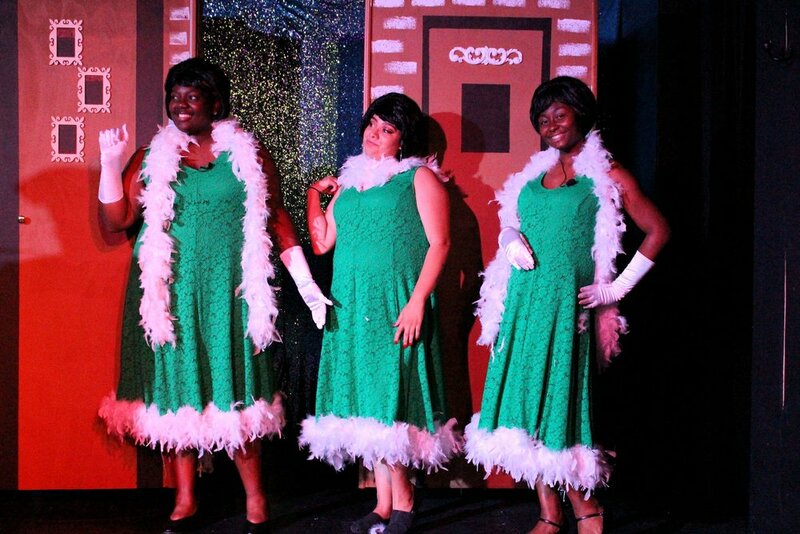 Charity Gilbert, Laiyah Smith, and Jamila Wicker raise the roof as "The Dynamites." Leading the cast as Edna Turnbladt is Bradley Watts (who shares the role with Jeffrey Sigley.) Watts is great fun to watch, and throws himself enthusiastically into the part. There’s a definite nod to Harvey Fierstein’s Edna, but Watts makes the role his own, not only vocally, but also through the creation of a slightly softer, somewhat less acerbic Edna than we’ve seen from other productions. Without ever losing the comedy or the no-nonsense personality, Watts gives us an Edna that retains her strength, but never at the cost of her femininity. Her rapport with husband Wilbur, played in both casts by Theodore Reynolds, is spot-on, and the two clearly trust each other as scene partners, creating a snapshot of the trust and affection between Edna and Wilbur. Reynolds is appropriately goofy without ever resorting to mugging for the audience, and makes Wilbur the lovable doofus with great success. As foils for the Turnbladt women, we meet Velma and Amber Von Tussle, a former pageant star, and her beauty-queen daughter, Lisa Baker and Zanna Mills, respectively, who share the roles with Leslie Dellinger and JoJo Wallace. Baker brings down the house with her “Miss Baltimore Crabs” number, and Mills, who demonstrated her skill at playing sweet and innocent as Mary Ann in last season’s Gilligan’s Island: The Musical, shows that she can play “mean girl” Amber with equal aplomb. Mills also makes her debut as a choreographer in this production, and the result is a series of well-rehearsed, toe-tapping, fun choreography that almost pulls the audience members into the aisles to boogie down. Ara-Viktoria Goins as Motormouth Maybelle. Much of the social statements in Hairspray center around the budding romance between Seaweed Stubbs (Joshua Wright) and Penny Pingleton (Camryn Harsey, alternating with Kari Tilghman.) Seaweed is black, Penny is white, and it’s 1962, so there’s plenty of era-based controversy over their relationship. While never preachy or heavy-handed, their story strikes at the core message of the play, which is that what’s on the outside doesn’t matter. Both performers approach the material with a light touch, but their message of social justice, equality, and the strength of unity comes through loud and clear. Wright and Harsey both bring strong voices and considerable stage presence to their roles. Debra Leopard and Mark DiNovo, as usual, turn in memorable, fully-realized, enjoyable characters. While Leopard is a hoot as Penny’s religious-fanatic mother (and also shines in a smaller role as the High School principal,) DiNovo had me doubled over with laughter every time he took the stage. His two “bonus” roles in “Good Morning, Baltimore” and “The Big Doll House” are absolute side-splitters, and his lame-clad Mr. Spritzer is a delight. Linda Lawton Brochin serves up a couple of hilarious cameos, and Karlton Timmerman’s Corny Collins hits all the right notes as a smarmy-but-charming dance show host, and manages to show off a very nice singing voice, as well. Were there a few negatives? Yes, but none that marred the experience. The musicians (yes, Hairspray utilizes live musicians, which I strongly support) could be a bit overpowering at times, but to be fair, we were seated fairly close to them. A couple of the soloists had to struggle with a note that was too high or too low, and I occasionally missed a lyric or two. There was one small glitch during a scene change, but by the time I even noticed, it had been corrected. OnStage Productions is a short, 20-minute drive from Downtown Columbia, and I strongly encourage everyone to make that drive. Hairspray is slick, polished, well-paced, and provides a subtle reminder of the importance of equality and acceptance in society. Frank Thompson is Theatre Editor for Jasper. Next up for the Jasper Project? 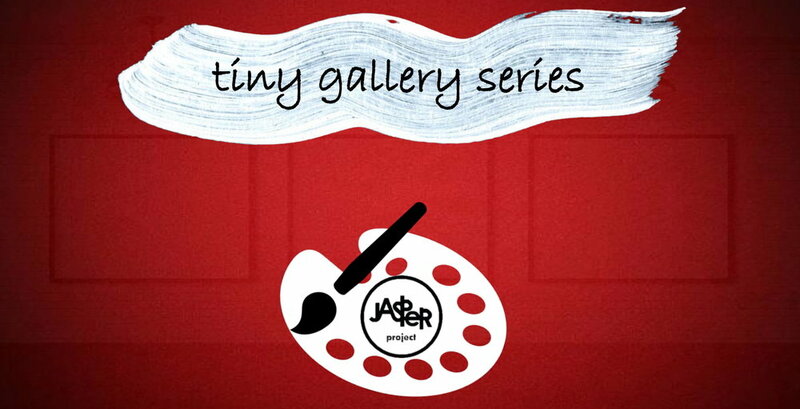 The Jasper Project is bringing a brand new project to light during First Thursday this month: The Tiny Gallery Series. Jasper’s goal with this project is twofold – to support artists in our community and to encourage budding art collectors to start their collections. During upcoming First Thursdays, Jasper will be teaming up with local artists to display their work for sale at affordable prices in their studio at Tapp’s Art Center. Tolen has been studying and working on his craft for decades now. 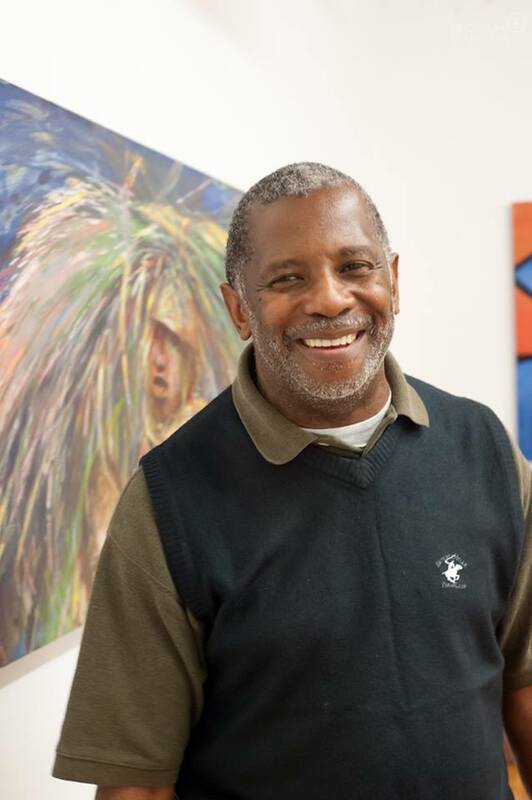 An art education major in college, he worked in both retail and real estate before landing the job as an art teacher at Camden Middle School – a job he cared for and worked at for 30 years. Beyond teaching, Tolen has been creating art since a young boy. He and his brothers used to draw together, and Tolen’s first love was film and photography. When he focused on painting in college, he became heavily influenced by the abstract expressionist styles of the 1970s, the art style that still influences him today. In his recent years, Tolen has tried to challenge himself by taking classes in different art styles, such as still life. All of these influences come together for his Tiny Gallery Series where there is one thing in particular to expect: eggs. 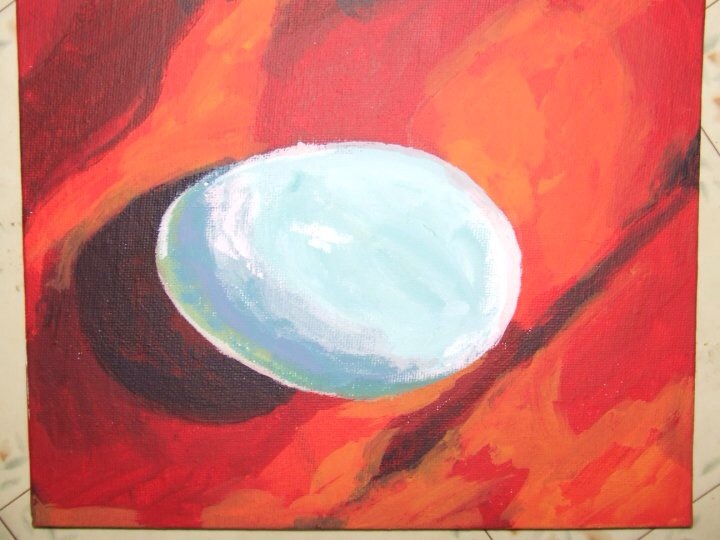 This will be the third time Tolen has shown his egg paintings this year, the first two times both to a positive critical reception. When asked about past accolades in his career, however, Tolen told a powerful story about a young girl in his first 6th grade class who took her passion for origami and taught an entire class of 50 students her art, holding their attention on a Friday far after the bell had rang. From this comes the importance of an event like the Tiny Gallery Series. Like what that girl did for her class, “Art inspires us; it educates us.” Tolen said. 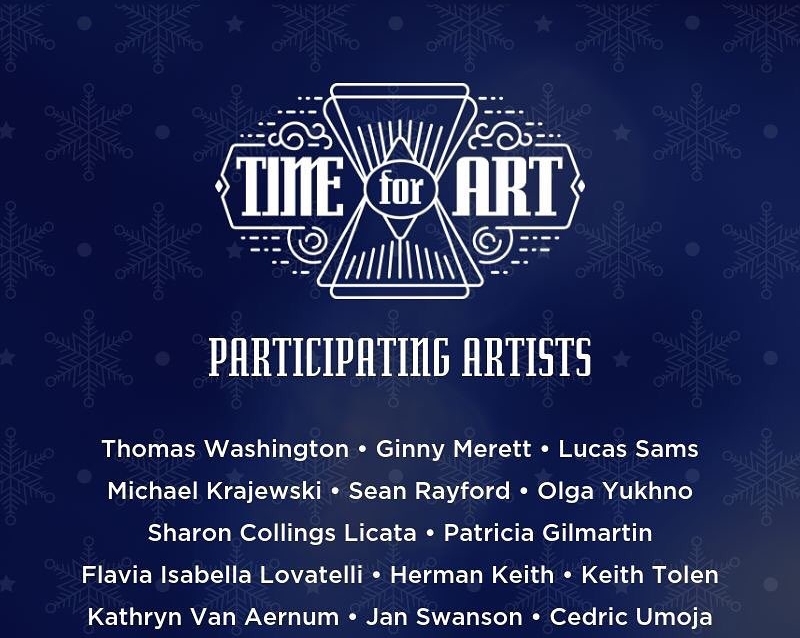 Future artists participating in the Tiny Gallery Series include Olga Yukhno, Bonnie Goldberg, Dave Robbins, and more. To see Tolen’s work, stop by Tapp’s Art Center in Studio #7 starting at 6:00 p.m. this Thursday, October 4th, and be sure take a piece of his passion home for yourself.